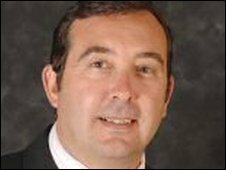 An Essex Conservative council leader has quit his party and joined Labour. Terry Hipsey blamed the Conservatives' taxation policies for his decision, as well as Prime Minister Gordon Brown's handling of the recession. His defection gives the two parties at Thurrock Council parity with 23 seats each, with two independents and one BNP councillor. Mr Hipsey said he could no longer "justify" Tory policies, particularly on tax. He said: "When speaking to constituents, I cannot justify David Cameron's decision to make his number one priority in a recession a tax cut, which would give hundreds of thousands of pounds to millionaires, but do nothing for the vast majority of Thurrock families. "In contrast, I have been deeply impressed by the way that Gordon Brown has recognised the urgent need to give real help to families now. "By joining the Labour Party, I hope to be able to support the Prime Minister's practical steps to help people in Thurrock out of this recession." Commenting on the resignation, Eric Pickles, chairman of the Conservative Party, said: "This resignation ends a deeply troubled leadership by Terry Hipsey. "It has more to do with his management and leadership style than conversion to another political party."